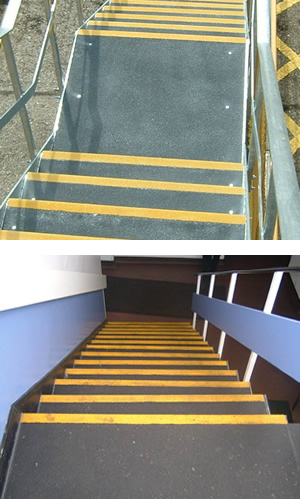 TreadSafe® GRP stair treads and matching landing covers are designed for internal and external applications. Manufactured from 4mm thick GRP, they are available in black with a yellow or white highlighted leading edge. They meet the current UK Building Regulations and the Disability Discrimination Act (2004). Standard sizes for stair treads are 345 x 55mm nosing in lengths of 3020mm, 1500mm 1000mm and 750mm and for landing covers 1200 x 55mm in lengths of 2440, 1200 and 800mm. Landing covers have a depth of up to 1200mm to allow most landing areas and top steps to be covered without the need for joints.